We went. We walked. We listened. We ate. We walked. We were inspired. We learned. We laughed. 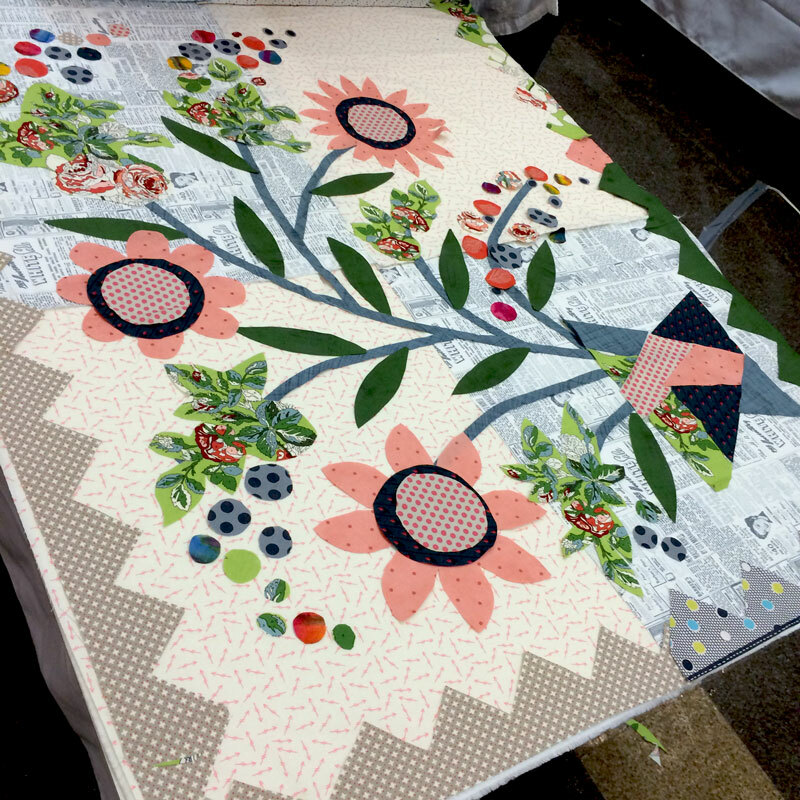 We had a really good time at the Quilter’s Take Manhattan, the annual event presented by the Quilt Alliance. I wrote about the event last week but after having gone, it was a bit different experience than I expected. 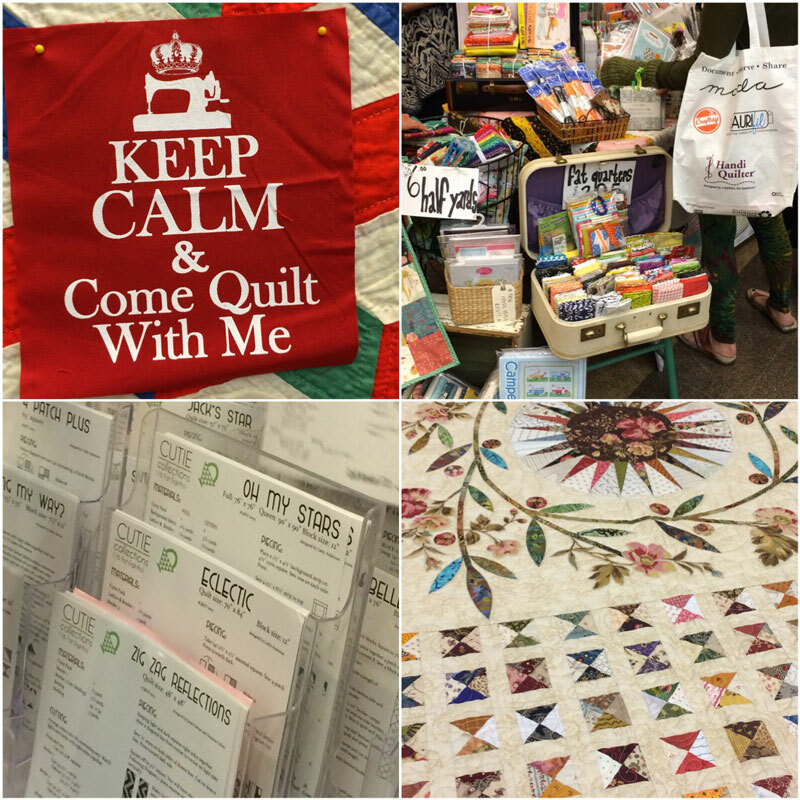 From what I’d heard and seen online, I thought it would be a little bit more like a quilt show – lots of quilts, vendors, happy quilters, etc. There is that but the focus isn’t on seeing pretty quilts and buying cool quilty stuff, it’s about so much more. Inspiration. The day started with presentations by Ricky Tims and Victoria Findlay Wolfe who – it turns out – are a whole lot more like the rest of us than you’d guess. They’re funny and they’re not quite sure how they wound up as quilters… truth be told, it’s the last thing both expected to be doing. But they’re driven to create and “make stuff”. Sound familiar? 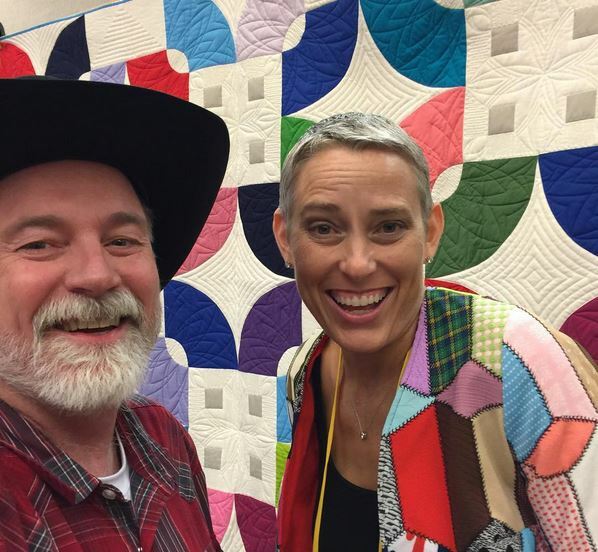 Both spoke about how being true to yourself is the first, last and middle step to being a better quilter. “Better”, not in the sense of perfect points and stitches, or winning ribbons but “better” in the sense of finding and creating joy in the doing. Celebration. 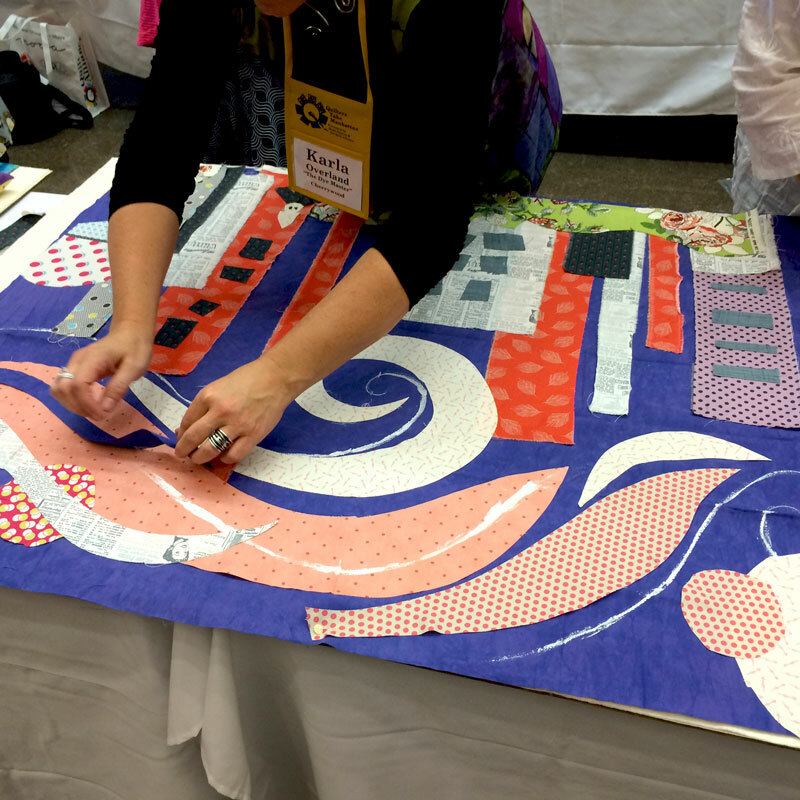 This event was about celebrating quilting and quilters. Okay, so that sometimes means “stuff” that makes us happy. Top left corner – That’s a label from Pat Yamin’s Come Quilt With Me. Top right corner – Rock. Paper. Scissors. They’re a wonderful little shop in Montclair, New Jersey. Lower left corner – the Quilt Basket of Pawling, New York. Lower right corner – Sunrise Scraps from Handfuls of Scraps by Edyta Sitar. Preservation. 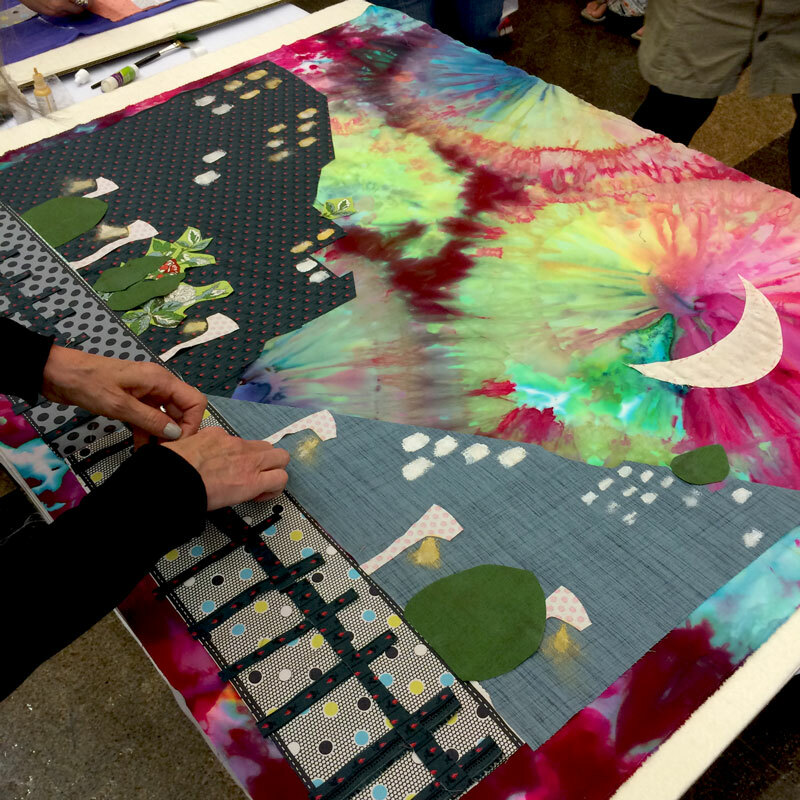 The Quilt Alliance was created to build a body of knowledge about quilting – not just the how-to but the stories behind quilts. Every quilt has a story. Some are short and some rival “War & Peace” in length. Funny or sad, interesting or not, there is a reason why a quilt was made. And every one of those stories matters. The original audio recordings and photographs from the recorded interviews done for the Quilters’ Save Our Stories are archived in the American Folklife Center at the Library of Congress. While the majority of interviews are done one-on-one, often in someone’s home, the Alliance will often record interviews in a public setting to increase awareness of the pr0gram and encourage others to participate. 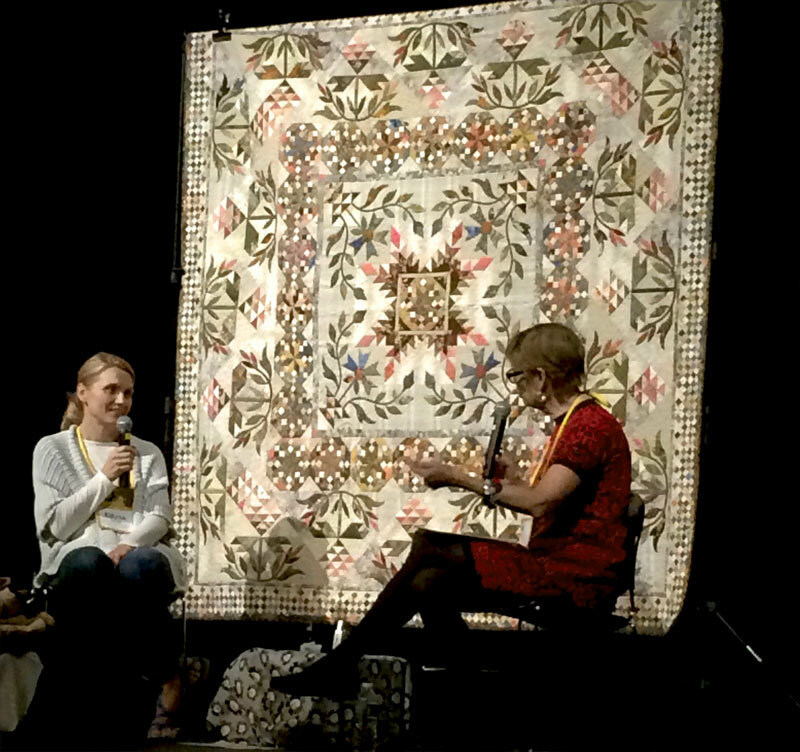 At this year’s event, Meg Cox interviewed Edyta Sitar about her glorious quilt, Common Bride. There were also quilt stories shared, recorded and preserved for four talented ladies from New York – members of the Riverbend Quilters. 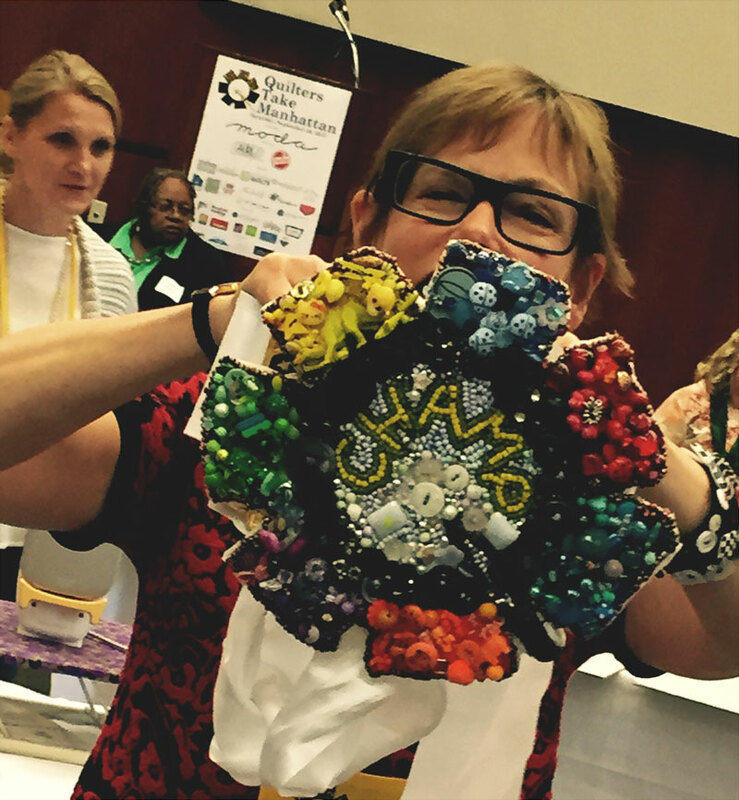 Edyta Sitar – no wonder she’s eyeing that awesome belt created by Frances Holliday Alford – of Laundry Basket Quilts. Karla Overland of Cherrywood Fabrics – those gorgeous hand-dyed that feel like velvet. Laurie Russman of NeonKitty and a Board Member of the Quilt Alliance. The stage is set. The fabrics are ready. We provided 11 half-yard cuts that the three challengers could use. They didn’t have to use each fabric but these fabrics had to comprise the majority of the finished project. Challengers could add a fabric to the mix but not knowing what they were getting until a few minutes before the match started… it was hard to know what to bring. Still. All three ladies created spectacular projects that “fit” their style. Laurie Russman’s project – glued, fused and painted in place. Laurie is a mixed-media artist so she knew her way around the paint bottle. An upside down view of Karla’s project. By the time she’d finished, she’d included the Pope and the building had the QTM logo. Karla was probably also the furthest along as her project was glued and fused into place. That gorgeous royal-purple background is one of her beautiful hand-dyed fabrics. Eydta. To think “someone” picked fabrics thinking they’d be throwing Edyta a heavy-duty “curve ball”. Voting was done by applause – noise. There were three judges – two with their backs turned to the audience to enhance the auditory-aspect of the response. The third judge had a noise-meter. It was a very close contest but Edyta was the noise-meter-documented winner. The three projects are then sold at “silent auction” as a fundraiser for the Alliance. We – Lissa and me – wanted it. Lissa went “big” with the first bid and was outbid. She bid again and yes, was outbid again. I was going to place the next bid and that’s when we realized that it was just one person bidding against us – the really nice woman giving us the “evil eye”. 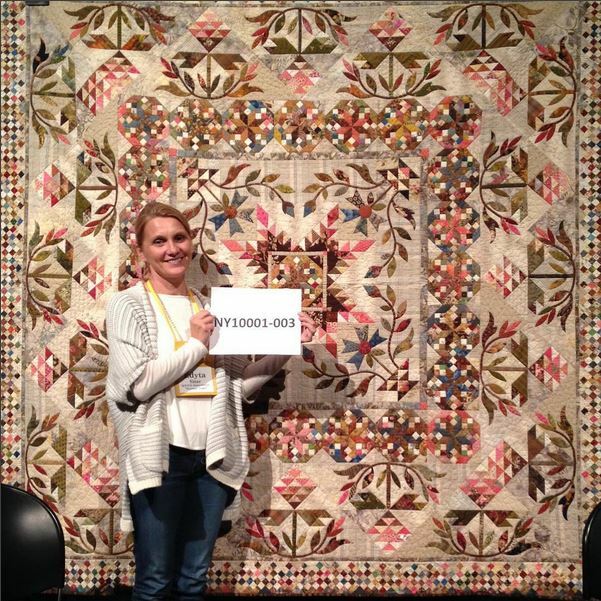 It didn’t help that Edyta had announced to the audience that as part of the winning bid, she would take the project home to fuse and quilt it to complete it. 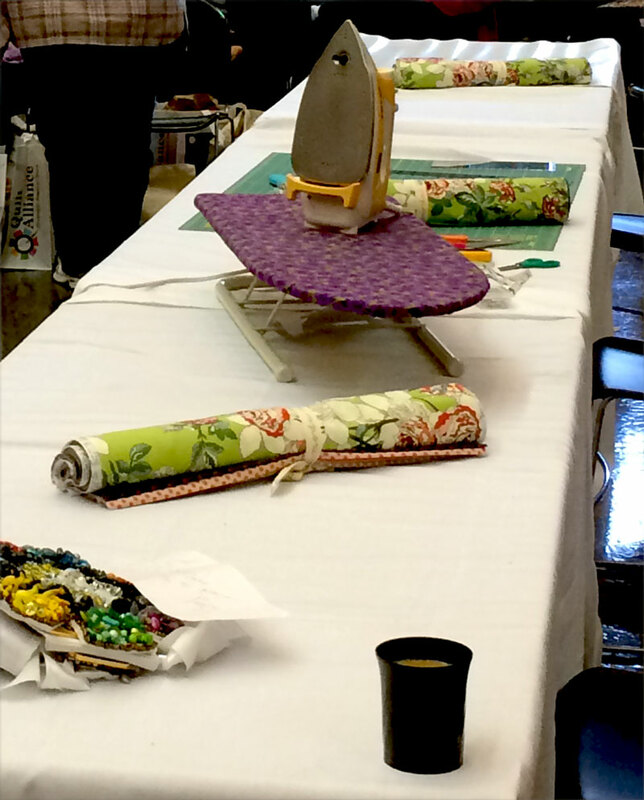 The event concluded Sunday with a presentation by Alex Veronelli of Aurifil Threads at The City Quilter. I’ll have more on that later but let it suffice to say that if you ever have the opportunity to attend an Aurifil presentation – run, don’t walk! Go! It was fascinating, educational and entertaining. Seriously – you’ll have a much greater appreciation for thread. 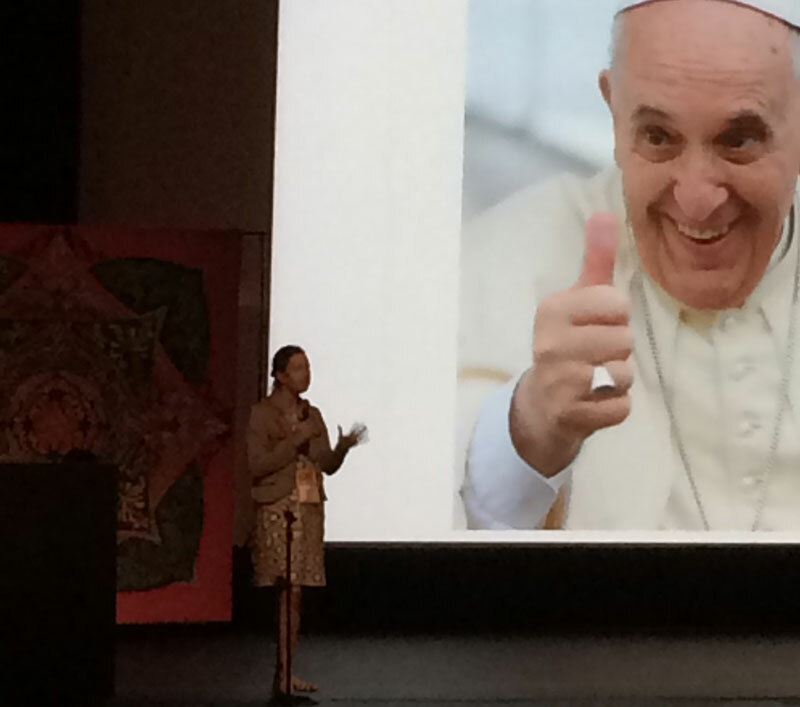 As for the Pope… while he was in New York City, he couldn’t break away from his busy schedule to attend the events. But he sent his regards. 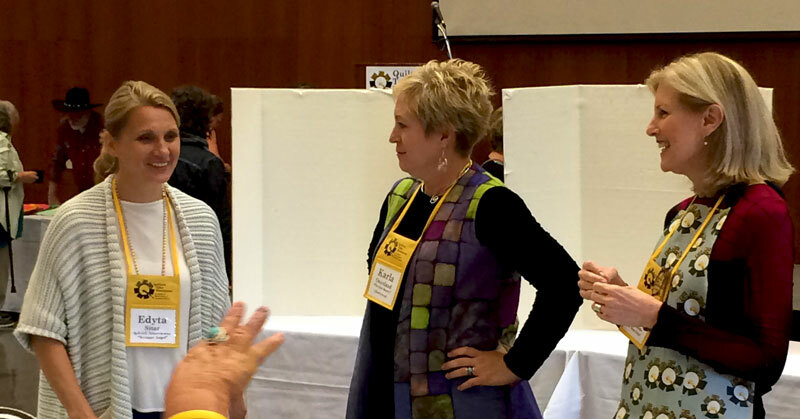 That’s Amy Milne, the Executive Director of the Quilt Alliance. A huge, huge thank you to Amy, and to Debby Josephs, the Office Manager, who arranged everything for us in New York, for making this such a terrific event. I am crossing my fingers that I get to go again because I love the stories of quilts and quilters. And New York City in September… I love that part too. Thanks for the stories and photos. For those of us in rural areas it was almost like being there….not. But I really enjoyed this post and all of this blog. What a fantastic account of QTM–thank you, Carrie and Lissa and Jillian, for adding to the awesome! 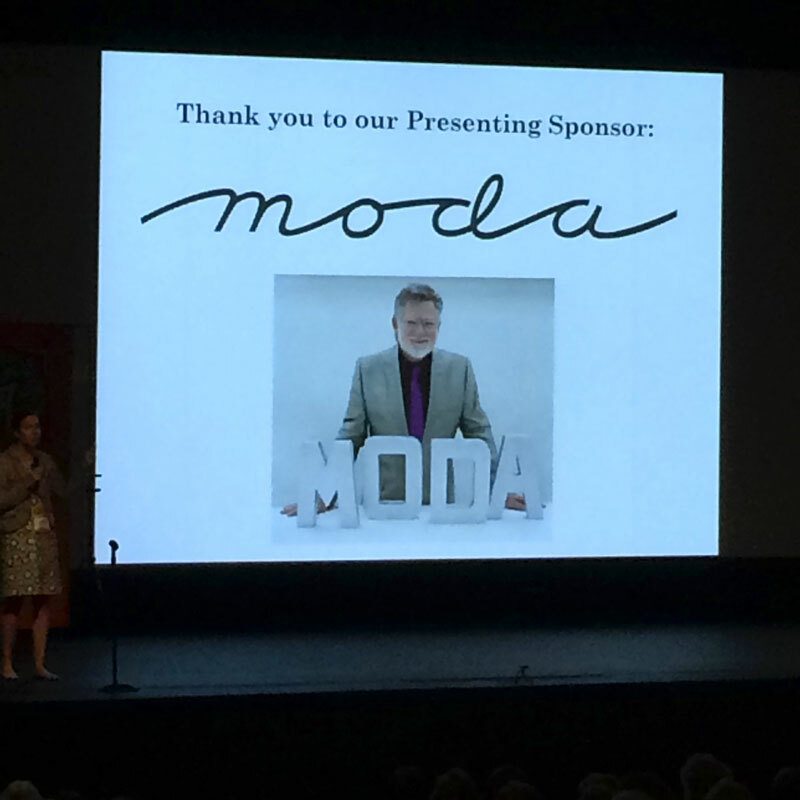 We’re so proud to be honorary members of the Moda family! Another fabulous posting. I love learning about why quilts are made. Learning their stories is the icing on the cake. Thank you Carrie. “Takeover bid” had me a little worried you rascal!! Thanks so much for the show tour! and i loved all 3 quilts, so glad I didn’t have to help decide the winner. Love NYC and love reading your blog! 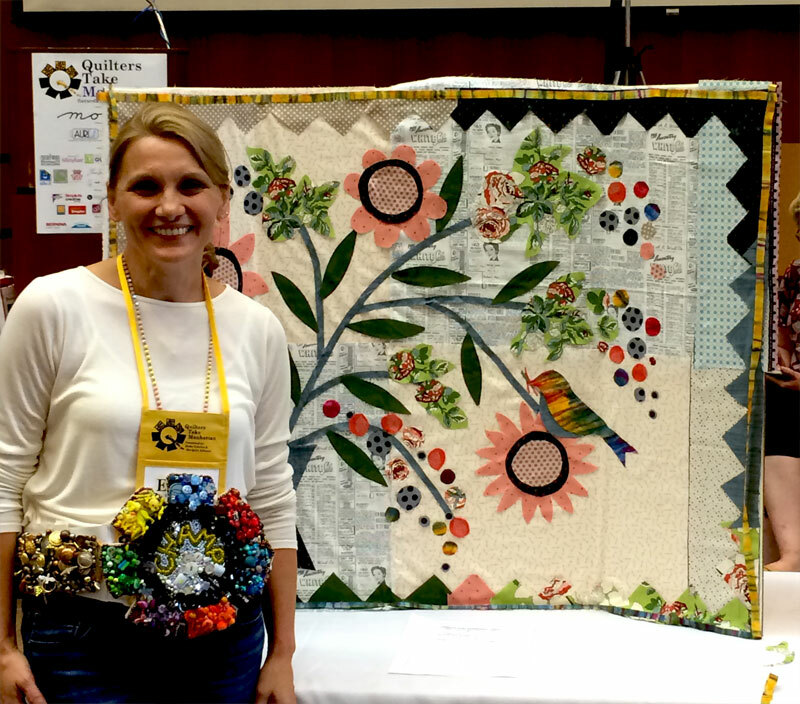 It was fun to hear about the Quilters Take Manhattan event. Thanks. Thanks for sharing this with us, great stories, great pictures. Edyta always makes me smile, her work, her personality, a great quilter.